Fact remains that progressive jackpots are the most attractive features of progressive slots. Mind you, the features are super exciting but the jackpots are the pot at the end of the rainbow. Progressive jackpots are a slot feature of a pot that grows as bets are placed. And it doesn’t stop growing until someone triggers it. So, the more players, the more bets are placed and the bigger the pot gets! 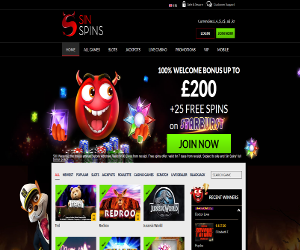 The total of the sinful progressive jackpots is over £5 million! And it’s growing with every second passed. Looking to win the jackpot? Try out the most popular progressive jackpot slot Fruit Fiesta. There are loads of things you could do with a massive jackpot. Think about it and make your way to Sin Spins.